Click here to purchase this book $98. As part of the import entry process, goods must be “classified” in the Harmonized Tariff Schedule of the United States and their customs value must be determined. It is the responsibility of the importer of record to use “reasonable care” to “enter,” “classify” and “value” the goods and provide any other information necessary to enable U.S. Customs and Border Protection to assess the correct duties, collect accurate statistics, and determine whether all other applicable legal requirements are met. 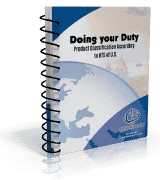 Likewise U.S. exporters have a due diligence obligation to report Schedule B codes or their HTS equivalents as part of the shipper’s electronic export information filing. Global Training Center’s “Doing Your Duty” was written by John D. Goodrich. Mr. Goodrich is an International Trade Consultant and Licensed Customhouse Broker with more than twenty-five years of experience in international trade. He is currently the principal in the consulting firm of JD Goodrich & Associates where his varied industry experience results in practical, actionable advice for his clients. An active member in the Twin Cities round table of the Council of Supply Chain Management Professionals (CSCMP), he takes a strategic view of the roles of international compliance and logistics in the greater supply chain. Mr. Goodrich is an engaging trainer and speaker on a variety of international logistics and compliance subjects as well as the author and co-author to several other trade books, which are offered here at GTC.